Kenny Clarke’s presence in Paris round the middle of October 1961 was too good a chance for Pim Jacobs and Rita Reys to miss. Pim, with his brother Ruud on bass and Wim Overgaauw on guitar, were one of the smoothest functioning jazz combos in Europe, so when he phoned the great drummer to fix a date Clarke jumped at the offer. The result was a joyously grooving, relaxed concert recorded at the Singer Concerthall at Laren in Holland on October 12. As a pair, Rita and Pim were an artistic marriage made in heaven from their first meeting, a fact mirrored in their real-life marriage. 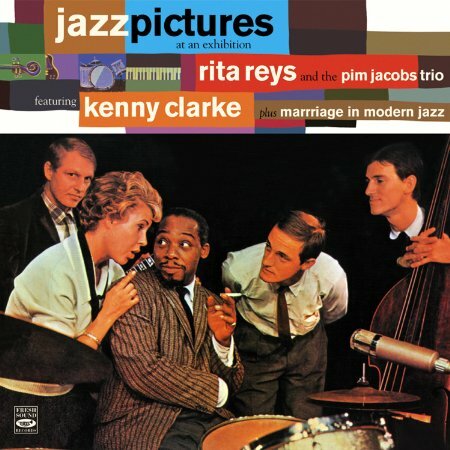 Serendipitously, the second album included here was the first record on which Rita Reys was heard at length with her soon-to-be husband’s trio. It was recorded in Hilversum on June 23, 1960, the same summer they were awarded first prize in the international competition at the “1er Festival Europeen du Jazz” in Antibes-Juan-les-Pins in July 1960; this last performance included here as a bonus.